What does Friday the 13th mean? Friday the 13th refers to a calendar date superstitiously associated with bad luck and evil doings. Had a great idea earlier; Trump is here on Friday the 13th. Have the streets deserted except for a series of identically dressed Jason Voorhees, just watching him go past. Turn a corner and there's another. Everyone else in the car has to pretend they are seeing crowds of people. Where does Friday the 13th come from? When the 13th day of any month falls on a Friday, generally referred to as Friday the 13th, it is popularly believed that it will bring bad luck, terrible occurrences, and even fatal accidents. The exact origins of Friday the 13th, as a term and superstition, are unclear. Anthropology professor Phillips Stevens Jr. has argued that fear of the date may have been inspired in the Middle Ages surrounding Christian beliefs about the death of Jesus Christ. According to Stevens, Jesus’s Last Supper is said to have had 13 participants, including Jesus, and occurred on the evening before his crucifixion on a Friday, leading to dark associations between Friday and the number 13. Other theories point more generally to superstitions surrounding the number 13 as an unlucky number and Friday as an unlucky day of the week. Friday the 13th notably appeared in the early 20th century with Thomas Lawson’s 1907 novel Friday, the Thirteenth, a story about a broker using his superstitious beliefs to win big in the stock market. 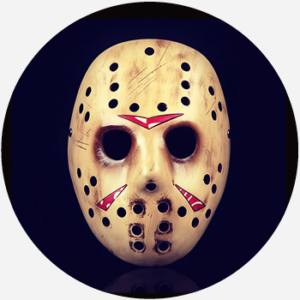 The term and superstition rose to great prominence in 1980 with the release of the slasher horror film Friday the 13th, starring the undead, machete-wielding, hockey goalie mask-wearing murderer Jason Voorhees (first played by Ari Lehman). In the film, Friday the 13th is referred to as “Jason’s birthday,” and in the decades since, 12 Friday the 13th sequels, a comic book and TV series, and various memorabilia have cemented the association between the franchise and Friday the 13th. Scientists have explored how people who think Friday the 13th is an unlucky day may be priming themselves for unlucky-seeming episodes on the day, à la self-fulfilling prophecy, but the day is not statistically worse than other days. Who uses Friday the 13th? Friday the 13th, which occurs whenever the 13th of any month falls on a Friday, is described as a day when bad things happen in the popular imagination and culture, especially when a Friday the 13th falls in October before Halloween. Halloween merchandise and content often incorporate Friday the 13th for spooky effect. Popular articles on the cultural phenomenon circulate online on Friday the 13th dates, as do jokes and casual references on social media. People may humorously blame the day for setbacks in speech and on social media (e.g., Of course I got in a car accident today, it’s Friday the 13th). Other people take their superstitions more seriously and avoid risks (e.g., It’s Friday the 13th, so I’m not gonna apply for that job until tomorrow just in case.). Friday the 13th is commonly bundled with other superstitions (e.g., Oh no, I saw a black cat today and it’s Friday the 13th!). Fear of Friday the 13th is sometimes referred to as paraskevidekatriaphobia, which began as a deliberately fanciful coinage.